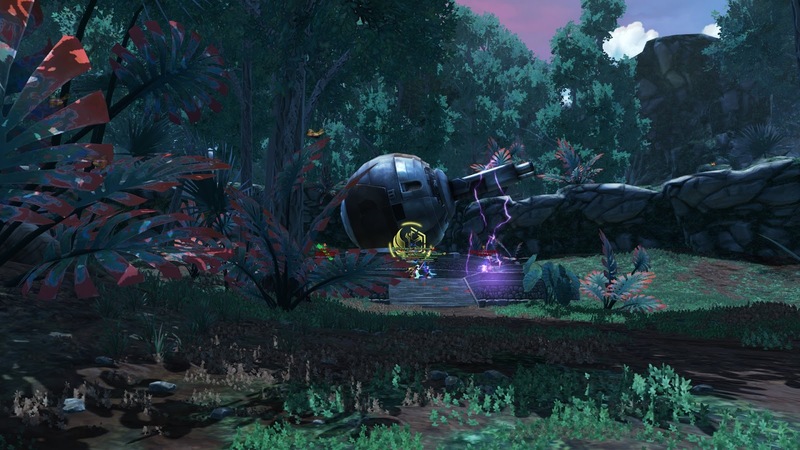 Last week's patch saw the (delayed) introduction of the new warzone Yavin Ruins. While I had initially been a bit disappointed when it turned out that the announcement of a new warzone actually meant "a new map for an existing type of warzone" instead of "a new game mode", remembering just how different Quesh Huttball turned out to be from regular Huttball still left me feeling excited. Unfortunately it took a while until I actually got an in-depth look at the new map - even though Bioware stated in the patch notes that they had increased the new warzone's chance to pop, I saw little evidence of this on my first day of trying to play it. 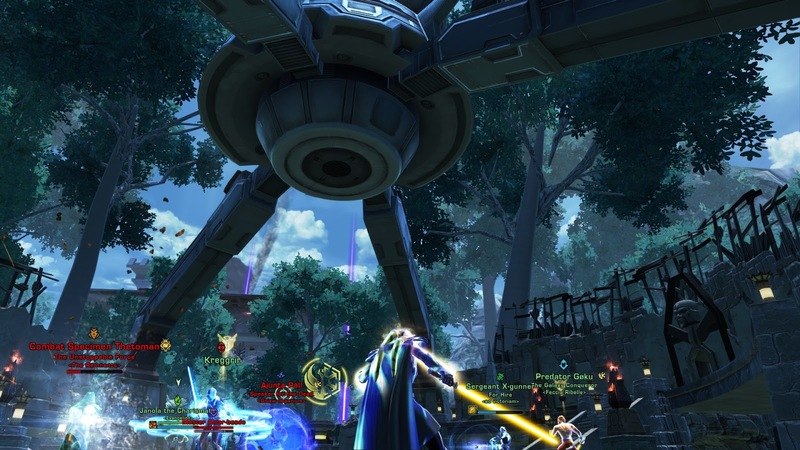 Two hours of chaining one warzone after another only took me to Yavin once, while Voidstar popped three times in a row. I'm guessing that they were trying to avoid a situation like during Odessen's release, where people were complaining about getting nothing else... but to me it seems that they turned the dial too far in the other direction this time. Either way, eventually I did manage to get a closer look, and it's been... interesting. 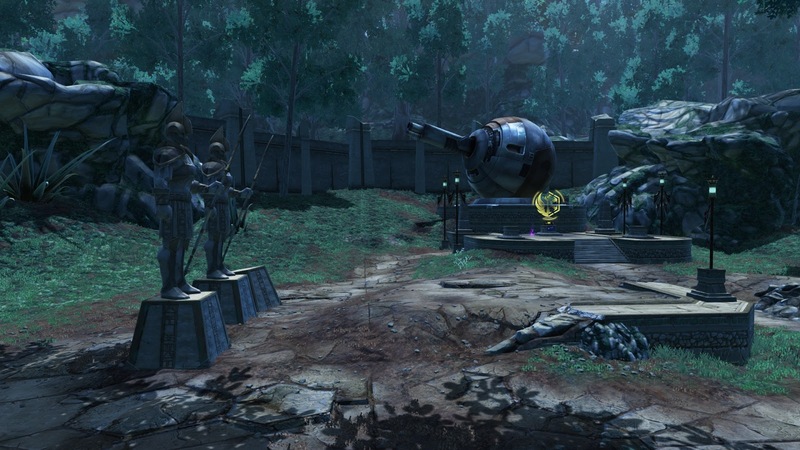 Yavin Ruins is not as different from Alderaan Civil War as Quesh Huttball is from regular Huttball, but there are still some noteworthy changes. It's also oddly... pretty. I never thought I'd say that about a warzone. So much beautiful foliage! I suppose it impedes visibility somewhat, but I consider that more of a feature than a problem anyway. What has stayed the same is the basic layout of the battlefield: Three turrets lined up in a straight row from left to right, with the two on the sides being connected via an underground tunnel that goes under the central turret. Said central turret is once again encircled by two crescent-shaped walls. Changes in the layout are comparatively subtle. For example you don't have to circle around the front or back to go from one of the sides to the middle, there is actually a little staircase leading straight up and across the wall on this map. The platforms in the middle don't have "railings" and offer slightly fewer opportunities to break line of sight. However, there is more space to fight around the side turrets, as they aren't directly up against a wall but instead against a slightly elevated platform which is nice for range and healers to stand on. I spotted two real mechanical differences: First, the turrets fire a bit faster, making the ships' health go down in increments of two instead of ten. This seems to make a psychological difference more than anything else - since a lot of people are bad at maths, the non-round numbers make it a bit harder to instantly spot the "point of no return" by which you are guaranteed to lose unless you manage to capture all the turrets, and which many therefore like to interpret as an excuse to give up. The biggest addition however is a new orange buff that can be picked up in the underground tunnel where you also find the two speed boosts (like on Alderaan). These give you a buff that lasts for a couple of minutes and cuts your turret capping time in half for the duration. These are pretty fun to use right now because a lot of people haven't quite caught on to their existence yet and are startled when someone suddenly caps a turret in only four seconds, making them great to use in the middle of a large scale melee when people don't expect it. However, it's a bit hard to predict how much of a role they'll end up playing in the long run. The basic idea seems to be to make it easier to cap a turret without requiring either the complete annihilation of the enemy team or use of a stealth class. (The buff does not let you go into stealth, so no need to worry about it being abused by stealthers.) That seems like a noble goal at least and something that could make Yavin Ruins a bit more dynamic and fun to play than Civil War. I generally like these base-capping warzones, but the sheer difficulty of capturing an objective on Alderaan can sometimes be a bit off-putting, something the speed buff seems designed to counter. Aside from that, I've been having fun watching people try to come to terms with communication in the new environment. I've previously expressed my amusement about the arbitrariness of "grass" and "snow" as directional markers in Alderaan Civil War, and of course Yavin provides a new challenge here because if you eschew cardinal directions, you have to decide on which landmarks to use as reference points instead and there is no agreement just yet on how to go about this. 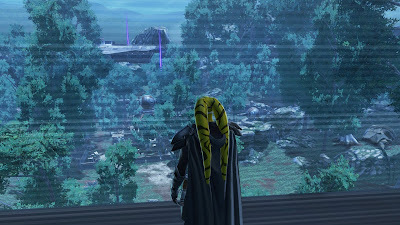 Things seem to be trending towards calling the side with more undergrowth "jungle" (though this can lead to confused calls of "everything is a jungle here", the same objection I've always had to "snow" in Alderaan) and to naming the other, more open side after the ruins that are located there, which I've seen referred to as both "relics" and "statues" so far. Finally it's worth mentioning that after Odessen, this is the second warzone that mixes players from both factions in its teams. While I'm against implementing this for all warzones (yes, I'm one of those suckers who cares about lore in PvP), it's nice to have another warzone where it can be justified and helps to give the losing side a break if one faction is constantly dominating (as you have a chance of ending up on the same team as the people who were beating you before). My early conclusion is that it's a solid addition to the roster. I've always ranked Civil War pretty highly among my favourite warzones, though I like both Odessen and Novare Coast even better. 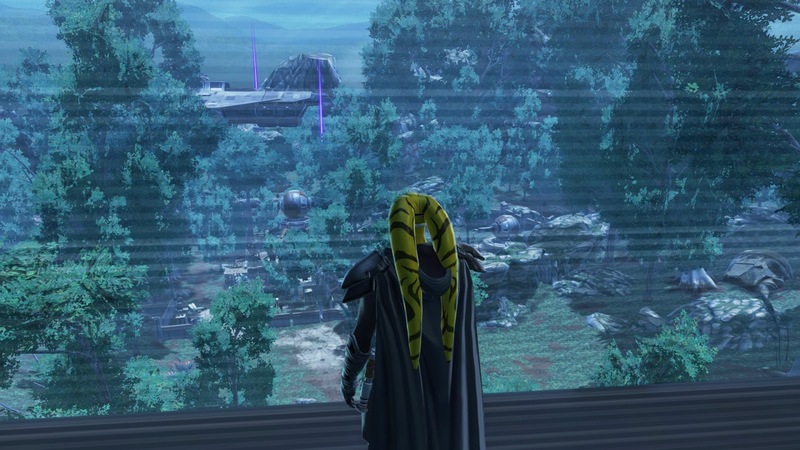 Yavin Ruins therefore has a solid foundation to build on and so far it hasn't disappointed, even if it's not as different from Alderaan as Quesh Huttball is from regular Huttball. Have you given it a try yet? ...und tausend Dank für die zahlreichen, lesenswerten Beiträge in diesem und in den vergangenen Jahren. I still have to try out this new warzone, but it indeed looks very pretty judging by your screenies! I don't mind that it's an existing warzome game mode too much, because (like you) I enjoy Civil War a lot. I also share your fascination for the emergence of naming conventions. The comment "but they're all jungle!" gave me a good chuckle. That was news to me, that the turrets are actually labelled on the map too! That's very helpful.